Some children bought him for a few shekels from Nissim, a man who lived in Jaffa, the old part of Tel Aviv. Nissim's place had supposedly been closed down after police discovered he was keeping horses and donkeys in horrendous conditions, killing them in gruesome ways, and selling their flesh as beef in the local market. While Nissim was no longer selling horsemeat as beef, he continued to collect broken down horses and donkeys and to dispose of them as he saw fit, usually as cheap cart horses. Shai had the misfortune of being one of these horses. The children who bought him housed him in a dark, dirty garage and fed him the poorest quality, least expensive hay they could find, not even bothering to remove sharp burrs from it first. Soon, Shai developed painful sores in his mouth. The hay held little nutrition and Shai grew thinner and weaker by the day. When he injured his foot, the children did not notice or perhaps they did not care, and they continued to ride him, even after he went lame and could barely walk. Shai's injury grew worse and became infected, creating an abscess in the soft part of his foot. The infection spread until the bone in his foot shifted 180 degrees, making it even more painful to walk. The children beat him, inflicting scars on his head and sides. Finally, when he was no longer of use to them, they abandoned him in the dark garage. The garage owner, increasingly alarmed at Shai's deteriorating condition, asked Avi, someone he knew who cared about animals, to intervene. Avi called Tel Aviv municipal vet Zvi Galin, who, as usual, refused to carry out his responsibility to remove Shai from his abusers. Galin had long ignored complaints about Nissim's horrendous acts, allowing him to operate in open disregard of the law. Why would he act now? Avi then called Hakol Chai, who arranged to buy the horse from the children and transport him to Ricki Bachar's farm, where previously rescued Saturday currently lives. One of Ricki's elderly horses had recently passed away and, luckily for Shai, there was now a place open in the barn. Shai hobbled off the truck and was led to a grass pasture, something he had never seen before in his life. His eyes opened wide with amazement and he lost no time in yanking the lead line from Avi and bending his head to inhale the fresh-smelling delight, oblivious to everything around him. After some time, Saturday was led out of the stable to meet his new barn-mate. Saturday took one look at Shai and raced to the fence between them to meet him. The two horses stood nose-to-nose, cheek-to-cheek, for a very long time. Everyone at the farm was struck by the intensity of feeling between the two animals and stopped what they were doing to watch. Was Saturday reassuring Shai that everything would be all right from now on, that he was in safe hands? So it seemed to the onlookers. After Saturday had been rescued, a Welsh pony on the farm had extended the same comfort to him, spending long periods of time in a similar posture, acting as a therapist for this terribly sad horse who had suffered so much and was near death. Was Saturday now returning the favor? Shai was examined and x-rayed by a vet and a farrier. When the farrier attempted to shave down his grossly overgrown hoof, the abscess burst and blood spewed out. The foot was treated and bandaged and given time to heal. Now the scars on Shai's forehead and sides have healed, and he has put on weight. In spite of his of his deformed right rear hoof, he can walk almost normally and without pain, thanks to orthopedic shoeing plus regular, x-ray-controlled trimming of the foot. "Shai" means Gift in Hebrew, and this beautiful horse has been given a second chance, the gift of life, thanks to caring CHAI and Hakol Chai members who make all we do possible. The procedures to help Shai's injured foot cost $500 per year, over and above the approximately $3,000 per year we pay for his boarding, routine veterinary check-ups, and vaccinations. We also pay $3,000 per year for the veterinary and boarding costs of Saturday, who, when rescued, was 250 pounds underweight, had scars over all his body, and nails driven into the soft part of his feet to attach pieces of wood so he would not slip on the pavement when pulling a heavy load. Please see Horses Removed from Extreme Abuse — Permanently for new information about Shai's abuser. Please help our work to bring about better treatment of these sensitive, intelligent animals. 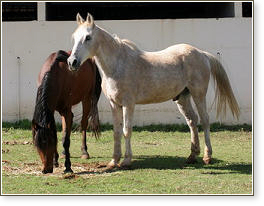 We will be building a sanctuary in Israel so there will always be a place to take care of injured and abused horses and donkeys.